A homeless shelter is in the middle of its strategic plan when a foundation approaches it with a proposal. Their work in the community had been noticed and there is demonstrated need for additional services. The foundation wants to fund a drop-in center to expand the shelter’s offerings and serve more constituents. Should the organization pursue the opportunity? It isn’t in the strategic plan, but it could vastly improve their impact. How should they proceed? Opportunities and challenges each arise on their own timeline – not yours. Traditional static strategic plans don’t adapt to the changing context in which nonprofit organizations operate, and this is just one of the many reasons that we think traditional strategic planning doesn’t work in today’s nonprofit sector. Our first post, “Going Through the Motions” covers several of these reasons in more depth. is adaptable, able to work for varying structures and timelines for driving impact. Spectrum’s strategic model accomplishes these goals. In today’s fast changing environment, organizations are forced to make important decisions continually as challenges and opportunities arise. To meet this need, Spectrum’s strategy model allows your organization to evolve from operating with a static strategic plan to thinking and acting strategically. Our two-part model focuses on first identifying and addressing an organization’s strategic issues to reach desired impact. 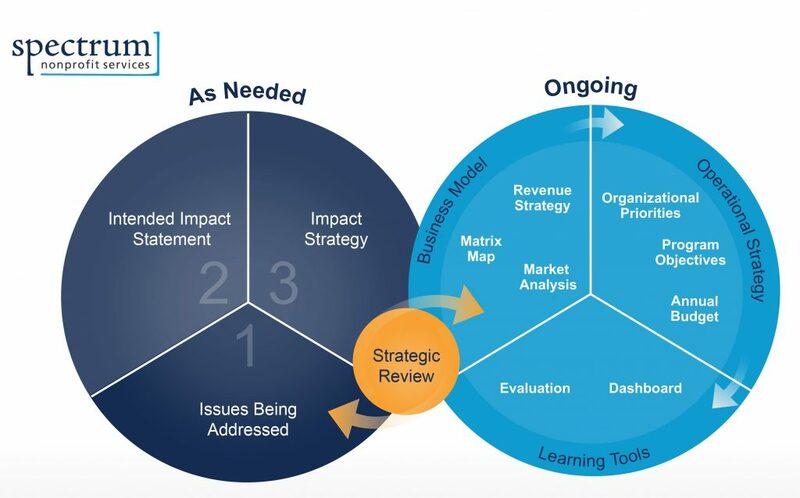 With this impact strategy in place, an ongoing analysis of the organization’s business model, market, and operations allows organizational priorities to emerge and be integrated into the annual budget and operational strategy. Learning tools allow for adjustment during implementation as the cycle repeats, or strategic review might reveal the need for a more fundamental shift in the organization’s impact strategy. In this way, your organizational strategy remains relevant far longer than a traditional strategic plan and leads the organization toward increased sustainability that encompasses both mission impact and financial viability. For a detailed explanation of the Model’s process, see below. Organizational strategy begins by articulating the purpose of the organization. What is the specific key issue your organization is trying to address? Is it mental health? Getting more kids into college? Exposing people to arts and culture? Articulating the purpose of your organization in this way provides a foundation for then articulating the organizations intended impact. The intended impact statement is a specific, more detailed statement which is complementary to your mission statement. It describes in detail what the organization does, with whom, and how the impact will be measured. With an intended impact statement in place, we then outline the impact strategy – Spectrum’s version of a logic model outlining the programmatic strategies and outcomes necessary for accomplishing impact. The steps outlined above in the first “As Needed” circle create a foundation from which the organization can operate for years. Operational programs may change, but absent a dramatic shift, the intended impact and impact strategy of an organization should remain fairly static. But what about adaptability? That arrives in the second “Ongoing” circle. For a strategic model to have agility it must include both an overarching organizational strategy and a relevant, connected, operational strategy. The “Ongoing” phase of the model integrates the organization’s business model, finances, programmatic objectives and learning. Many traditional strategic planning processes separate the financial and programmatic discussions. No other sector, especially one where money is worth more than….well anything, would find this a best practice. Relate this example to the private sector for a second. Can you imagine a car manufacturer moving a project beyond a concept without analyzing the expenses and market for the vehicle? There are many examples of what occurs with sales when those factors are not accounted for, and they are not pretty! Taking this concept back to the nonprofit sector, you might often hear “fundraising will figure it out”, which we believe is an example of poor leadership and is a practice that should be stopped. Integrating your business model through a Matrix Map, Market Analysis and the identification of a Revenue Strategy are all a part of sustainable operations and strategic thinking. Even with the best of plans, strong organizations are continually learning and adjusting as they implement. The Spectrum model includes a learning tools phase, made up of a dashboard for continual updates and program evaluations, which allow the leadership to monitor, learn and adjust. We use learning tools to begin discussions around the strategic review process, an opportunity to assess if the organization is moving in the right direction or if leadership will need to evaluate where resources are focused. Our strategy model is not built around a “roadmap to success.” Our model is built around the idea of integrating strategic decisions in partnership with strong leadership to gain organization-wide buy-in on operations moving forward. For true strategic direction you need your board and staff thinking strategically, a strategic report will not create culture. Since we know that most strategic decisions are made outside of strategic planning processes, our model hinges on a strategic review stage for leadership to review the data collected with their learning tools and make a determination whether a new path is needed. Move your organization towards strategic thinking and away from strategic planning with a model and timelines built around impacting your community. Organizations providing services from beginning of school to end of graduation might evaluate their foundational process every 15 to 20 years, as their services might take that long to show their full impact. That’s not to say the more operational steps will be static over that time frame – which is why the Strategic Review process and your leadership are so important. 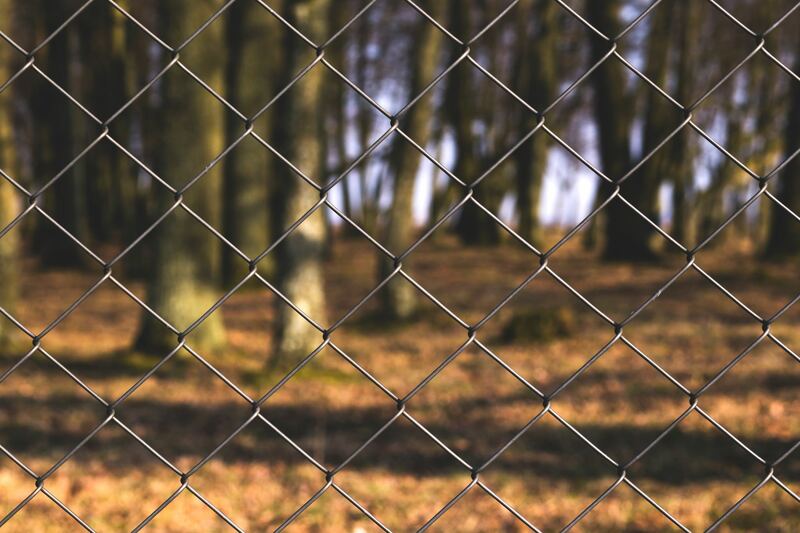 By banning from the five year plan your organization will discover that it can focus more on the long-term impact of your programs without an arbitrary “x-year” timeline hanging over your head to track. Through this model you will build realistic measurements to keep your impact on target – and stay educated to make a strategic review as a leader. Moving in this direction allows organizations like the homeless shelter to know that yes – they should move forward with the foundation’s request. With the foundation’s support, they will be empowered to increase their impact within the community that they are serving – without having to throw away that strategic plan that took their staff and board months to put together. Like we said in our last post, we want to know what you think. What makes sense? Where do you see problems or concerns? Share your thoughts on what it will take to build a better future below or by contacting us.